Be where wise mothers are! Join FICOBank’s caring, yet exciting, savers club for mothers who are 20 to 60 years of age. 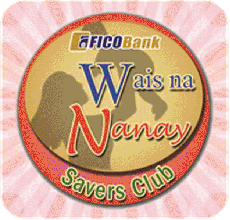 Wais na Nanay Savers Club (WNSC) is especially designed to foster financial literacy among mothers like you. It is your best source of getting the fundamental money-management skills, which will enable you to make any of your family’s aspirations a reality. At WNSC, you will learn: (i) the lessons of responsible financial behavior; (ii) the difference between needs and wants; (iii) the value of saving no matter what the family income is; and (iv) the importance of having more savings. Opening a savings account at FICOBank, through the Mobile Money (M-Money) Banking platform of GCash, is the best way to start this. Just visit the nearest FICOBank branch in your area, open an Ordinary Savings Account with minimum initial deposit of Php100.00, avail of a GCash co-branded M-Money card with an application fee of Php100.00, and complete the WNSC application form. There it is! You’re now a member of a prestigious savers club that will help you become a wiser mother. WNSC is a club-based savings program for mothers. Transactions are recorded in a passbook. With a GCash co-branded M-Money card that can be used as a Debit/ATM card, with two free-of-charge withdrawal transactions per month on any Bancnet and Megalink ATMs nationwide. Deposit transactions can be made through mobile phone, powered by GCash. There are no restrictions on withdrawal, and the fund can be accessed through over-the-counter and ATM withdrawal. Club members will become wiser in managing the finances of their family; thus, enabling them to save more and have more. They will also experience the convenience of saving money via mobile banking. So, register as a club member now! With WNSC, your light will shine even brighter, as you become a wais na nanay with FICOBank.